...Or Something: Where on (Google)Earth #40? Just so y'all know, I did not win Wo(G)E #39....sagan did. But, since sagan does not have a blog (but maybe soon? ), Kent proposed that the first person to comment could take the next one. And then I strolled on by...right place, right time. So Ron tallied sagan for the win on #39. So, here we go. Wo(G)E #40 is below. The only clue i'm gonna give is that i've been thinking a lot about this river in recent weeks. Click on image for a higher resolution. This is an oblique view and note north arrow. p.s. to my new readers out there, the Where on (Google)Earth? series started on this blog several months ago, but has now been serialized such that the winner takes the next installment. Simply put the coordinates in the comments below to play....we tend to pick geological features, so bonus if you can say anything about it. Santa Paula, California (according to Google Earth). 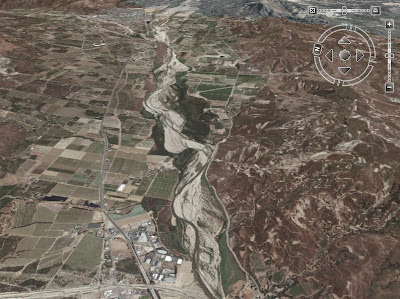 That's the Santa Clara River, which drains part of the San Gabriel Mountains, just north of LA. It runs into the Pacific somewhere around Oxnard. Yep....you got it, that is the Santa Clara River, which just downstream (down in that view) empties into the Pacific Ocean. See this post from while back. I've been working on a project trying to figure out the sediment flux of that river from the turbidites in the adjacent basin. The next Wo(G)E is yours!! Sorry to be slow getting a new one up! It's posted now. Hopefully it will be really easy, because I've got to leave for a field trip in two days. Oooh, I'm so conditioned by the last couple WoGE's I assumed the Schott Rule was in effect even though it wasn't invoked. No problem though - I probably wouldn't have gotten this one right off the bat anyhow. Well done, Kim! Thanks for setting the precedent of posting just an oblique view, Brian. I've been wanting to do this but I didn't want to disturb the precedent of including a traditional overhead map view. I think this opens up a lot of new possibilities for the WoGE series and makes even better use of Google Earth's unique capabilities. It may take me a while to put a good one together, but look for a variation on this theme in WoGE #42. 8/28/07: ...Or Something is called Clastic Detritus and can be found at http://clasticdetritus.com/. Please update your feeds and blogrolls. COMMENTS HAVE BEEN CLOSED DOWN...PLEASE GO TO NEW BLOG. What is this blog all about? Check out these posts to get an idea. Review of film "End of Suburbia"
Big changes for "...Or Something"